With the advent of so many dual career marriages, the division of domestic responsibilities has become a major source of marital conflict. Changes in our cultural values have contributed greatly to the problem, because there is now almost unanimous agreement that both a husband and wife should share these responsibilities, particularly child care. But change in behavior has not kept pace with the change in values. Traditionally, wives have assumed most household and child-care responsibilities, while husbands have taken the responsibility of providing income for the family. While men are changing the diapers, wielding the mop, and tending the stove more often than ever before, it usually isn’t nearly enough. In dual-career marriages, men, on average do less than half as much child care and housework as their working wives. As most women have figured out by now, men are not very motivated to do housekeeping. Many husbands think that any effort to help with household responsibilities represents a monumental sacrifice. But from the wife’s perspective, he is simply doing a small part of his fair share of the work. In many of these marriages, the husband demands that the wife do most of the work, and the wife demands that the husband do it. Neither feels it is their responsibility. 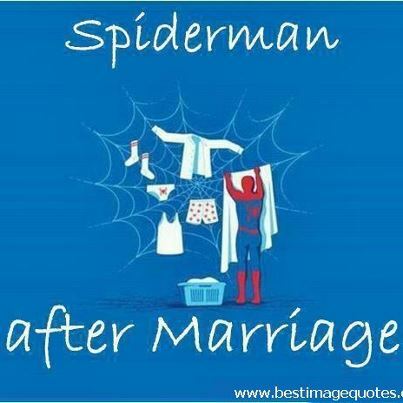 Domestic responsibilities are a time bomb in many marriages. Marriage usually begins with a willingness of both spouses to share them. Newlyweds commonly wash dishes together, make the bed together, and divide many household tasks. The groom welcomes the help he gets from his wife because, prior to marriage, he’d been doing it all alone as a bachelor. At this point in marriage, neither of them regard domestic responsibilities as an important marital issue. But the time bomb is ticking. When does it explode? It’s when children arrive! Children create huge needs, both a greater need for income and greater domestic responsibilities. The previous division of labor is not obsolete. Both spouses must take on new responsibilities. Which ones should they take? In most modern marriages, both spouses opt for income, leaving the domestic responsibilities to whoever will volunteer. It’s a recipe for disaster, at least for most working women, because they end up doing most of the housework and child care, resenting their husbands’ lack of support. If household responsibilities are given to whoever is in the mood to do them, nothing much will be done. If one spouse demands help from the other, that will also have an unsatisfactory outcome. But if assignment of these tasks can be mutually agreed upon by willing spouses that accept the responsibility, everything will run smoothly. I would like to propose to you a solution to your conflict. My solution will not only resolve your conflict, but it will meet the need for domestic support. This solution will require you to do something that is essential in solving most conflicts: get organized. It means you must think through your problem carefully and systematically. You will need to write down your objectives and create solutions that take each other’s feelings into account. While you may find all of this awkward and terribly “not you,” there is not other way. Besides, when you’re done, you may find it to be more comfortable than you anticipated. First, make a list of all of your household responsibilities including child care. This list should (1) name each responsibility, (2) briefly describe what must be done and when to accomplish it, (3) name the spouse that wants it accomplished, and (4) rate how important it is to that spouse (use a scale from 0-5, with 0 indicating no importance and 5 indicating most important).Both spouses should work on this list, and it will take several days to cover the bases. You will add items each day as you find yourself accomplishing various tasks or wanting them accomplished. Washing the breakfast dishes—clearing off the breakfast table every morning; washing, drying and putting away all the breakfast dishes and utensils that went into preparing breakfast—Becky (4); John (2). Feeding the cat—put cat food and water in the cat’s dishes at 8:00 a.m. and 5:00 p.m.—John (5); Becky (0). When you’ve finished your list, both of you should be satisfied that it includes all of the housekeeping and child-care responsibilities that you share. You may have as many as a hundred items listed. Just this part of the exercise alone will help you understand what you’re up against with regard to the work that you feel must be done. Now make two new lists, one list titled “his responsibilities” and the other titled “her responsibilities.” Then select items that you are willing to take full responsibility for all by yourself. These are tasks that you would enjoy doing, don’t mind doing, or want to do yourself so they can be done a certain way. When you have added an item to one of the two new lists, cross it off the original list.If both you and your spouse want to take responsibility for the same items, you can either take turns doing them, or arbitrarily divide them between the two of you. But you must approve each other’s selections before they become your final responsibilities. If one of you doesn’t feel that the other will perform the task well enough, you might give each other a trial period to demonstrate competence. Once you have taken responsibility for any item, your spouse should be able to hold you accountable for doing it according to his or her expectations. Now you have the three lists: (1) the husband’s list of responsibilities, (2) the wife’s list of responsibilities, and (3) the list of household responsibilities that are not yet assigned. Assuming that all tasks you wouldn’t mind doing have been eliminated, we’re left with those that would be unpleasant for either of you to perform. These are items that neither of you wants to do, but at least one of you thinks should be done.It’s at this point that you may choke on my recommendation. I suggest that these unpleasant responsibilities assigned to the person who wants them done the most. It’s a reasonable solution, since to do otherwise would force responsibility on the one who doesn’t care about them. Consider for a moment why you want the other person to do these unpleasant tasks for you. Even though you are the one who wants them done, you want the other person to relieve you of the pain you suffer when you do them. In other words, you want to enjoy the benefit of having them done, but you are not willing to suffer for it yourself. You would rather see your spouse suffer. You want to gain the benefits of having these unpleasant tasks accomplished at your spouse’s expense. You may argue that these tasks are not really what you want done, but rather what shouldbe done. For example, you may say that they’re for the benefit of your children. But when you use that argument, you imply that your spouse is such a slob and so out of touch that he or she doesn’t even know or care what’s right or what’s best for the children. While that may be precisely the way you feel, it’s incredibly disrespectful. You’re assuming that your view of the situation is superior to that of your spouse. You’re trying to straighten him or her out. But I guarantee you that your argument will not be well received. Whenever you try to impose your way of thinking on your spouse, you make your spouse feel bad. And you usually won’t win the argument! So why do it? By following this procedure you may decide to change your attitude about some of the responsibilities on your list. When you know that the only way to do something is to do it yourself, you may decide that it doesn’t need to be done after all. In fact, you may find that what kept you convinced of its importance, was the notion that your spouse was supposed to do it. So far, we have a fair division of labor, but we haven’t addressed the need for domestic support. So there is one more step in my plan that may not make you feel much better about my solution, but it will help you meet one of your spouse’s most important emotional needs. Step 4: Meet the Needs of Domestic Support by Assuming Responsibilities. Up to this point, the assignment of household responsibilities is fair. You’re dividing responsibilities according to willingness and according to who benefits most with their accomplishment. But marriage takes you one step further. In marriage, you do things for each other because you care about each other’s feelings, not just because you want them done yourself.You may not be willing to take responsibility for a certain task because, quite frankly, you don’t think it needs to be done. But if your spouse thinks it needs to be done, it may be an opportunity for you to meet his or her emotional need for domestic support. Let me repeat a concept that is crucial to your marital happiness. If you and your spouse are in love with each other, you will have a happy marriage. If you aren’t in love you will feel cheated. So whatever it takes to trigger the feeling of being in love with each other is well worth the effort. If cooking dinner or ironing shirts or picking up socks triggers the feeling of love in your spouse, why not do those things? In fact, if meeting any of the emotional needs that I’ve described in this book really does create the feeling of love, why would anyone resist doing it? It’s not only an act of care, but is an act of supreme wisdom. By doing for each other what you appreciate most, you will have what few marriages have, the feeling of love throughout your entire lives. The above article is an excerpt of the book, "His Needs, Her Needs: Building an Affair-Proof Marriage" - by Dr Willard Harley (published by Fleming Revell).